The Scorpion XXL borrows the name from one of Kyosho’s legendary racing machines, and it incorporates some scale features that made the original car popular. The original Scorpion has earned its place in history as one of the most significant cars of its time, and the new Scorpion XXL is built to do the same using modern design, smartly chosen scale and a brutally powerful drive system that takes advantage of all the torque that the new XXL .28 engine can produce. 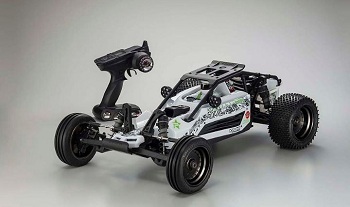 The Scorpion XXL is a brand new concept from Kyosho – a monster size 2WD Buggy (630mm/24.8 in. long) with a scale body design and a modern power system that makes this an all terrain beast. The key is its size – a large size vehicle which is not too big but just the right size. The Scorpion XXL is roughly 20% larger than a 1/8 racing truck (ST-RR Evo) and is about 15% smaller than a 1/5th scale car. This size is perfect for running on a typical 1/8-scale track – no need for a specially designed track. The Scorpion XXL looks good. Of course you might expect us to say that, but “scale” is trending as one of the most popular features of modern RC vehicles, and the Scorpion XXL brings home that timeless scale appeal of a desert racing buggy with a real roll cage, a driver figure and even some rear pod bodywork. It’s as functional as it is attractive with side vents that direct cooling air over the ESC and motor, the roll cage actually protects the body, and the running lights can be fitting with a BRIGHT optional LED light kit that features 7 high-intensity LEDs per light for action after dark (No.SXW008). A number of aftermarket accessories will also be available to customize the appearance and enhance the performance of this machine. The Scorpion XXL is targeted towards bashers, scale enthusiasts, and club racers. It doesn’t really matter what perspective you bring, you can get some serious fun from this machine. It’s hard not to like its practical and economic approach to find tracks and minimizing the cost of operation, but all that even seems to go out the window when you pull the trigger. The only thing you risk after that is breaking too big a smile.